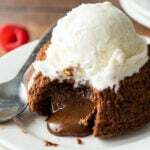 This warm and gooey Chocolate Lava Cake recipe is just 5 simple ingredients and ready in less than 25 minutes! In a microwave safe bowl combine chocolate and butter. Microwave for 1 minute and 20 seconds. Whisk until the chocolate has melted and is smooth. Add the powdered sugar, 3 WHOLE eggs and 1 egg YOLK, whisk till combined. Add 6 tbsp of flour and whisk until combined again. Liberally spray 4 small (1 cup) custard cups with non-stick cooking spray, and evenly fill with batter. Bake on a cookie sheet in the oven for 15 to 16 minutes until the outer edges are set and the center is soft set. Remove from oven and let cool for 3 to 5 minutes before inverting onto a plate. Serve with ice cream if desired and enjoy! You can mix up the chocolate cake batter up to 2 days ahead of time, separate it into the ramekins, cover tightly with plastic wrap and store in the refrigerator. Let the cake batter come to room temperature before baking. Once the cakes have been baked, remove them from the ramekins and let them cool completely. Wrap tightly with plastic wrap and freeze for up to 3 weeks. To reheat, unwrap cake and microwave on a microwave safe plate for 1 minute, or until heated through and chocolate center is still gooey.